Suunto Ambit2 has a 3D compass that allows you to orient yourself in relation to magnetic north. The tilt-compensated compass gives you accurate readings even if the compass is not horizontally level. The compass will switch itself to power saving mode after one minute. Reactivate it with Start Stop. 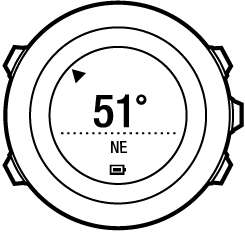 For information on using compass during exercise, see Using compass during exercise.